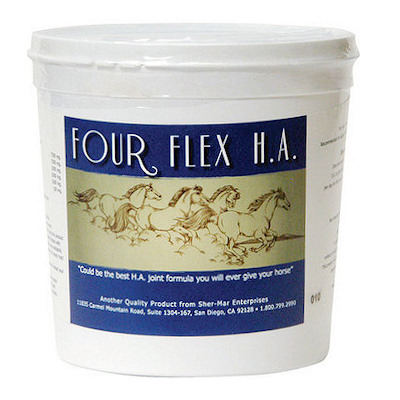 Four Flex is popular 4-in-1 joint supplement. Each 1 ounce (scoop) contains 7,500 mg Glucosamine Sulfate, 7,500 mg. MSM, 2,500 mg. Yucca, 1,200 mg. Chrondroitin Sulfate And 1,000 mg. Vitamin C in a stablized rice bran base. Feed 1 oz. daily. 1 oz. scoop is included. Very palatable, horses love it!